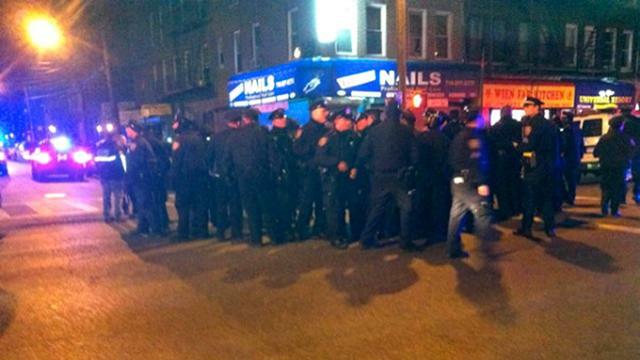 NYPD Battles Parts of Brooklyn. MSM reports nothing. Eighteen have been arrested in Brooklyn’s East Flatbush neighborhood as New Yorkers came out for a third night of protest over the police killing of 16-year-old Kimani Gray, police reported. The demonstration began at Brooklyn’s 67th Precinct in East Flatbush, the part of New York’s Brooklyn section where Gray was shot to death by police on Saturday. Witness and police accounts differ on whether Gray was brandishing a weapon before he was killed. Brooklynites were heard shouting “murderers!” at the massive police presence Wednesday as officers prohibited people from even stepping onto the street in one of New York’s poorer neighborhoods while police helicopters circled overhead. Reinforcements were brought into the neighborhood early in the evening after a police car’s rear windshield was smashed at the tense but generally peaceful demonstration. “About 45 arrests so far, lot of young black women in particular,” said Twitter user @shushugah, reporting earlier from the demonstration. Police only confirm 18 people arrested. “The block is closed,” a police officer told Ustream user stopmotionsolo as he tried to film the protest. “Party’s over,” the officer added. Gray’s killing struck a nerve in East Flatbush, where in August 2012, 23-year-old Shantel Davis was shot to death by a police officer after being dragged out of her car. The officer claimed she had stolen the car she was driving at gunpoint. She bled to death. The NYPD has long struggled with accusations of systematic racism, and Dix says U.S. authorities have their priorities mixed up. “The police – whenever they murder or kill a black or Latino youth – it is always justifiable homicide. The witnesses tell a different story, and this happens again and again,” Dix told RT. Help us provide honest, inspiring, action-provoking independent media from the Occupy movement to the rest of the 99% – please donate now! This entry was posted in MEDIA, OPINION - POLITICAL, SOCIAL, POLITICS/DOMESTIC, SOCIETY and tagged 99%, brooklyn, east flatbush, Kimani Gray, nypd, occupy, Shantel Davis by Thinkwing Radio. Bookmark the permalink.